IN STOCK, Roll of 3" leaf/dust collection hose. Price is per 100' roll. 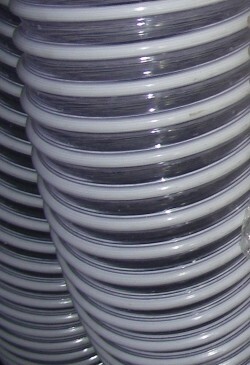 3" CLEAR PVC lawn, grass and leaf collection hose. Spiral Wound, Corrugated Exterior, Smooth Interior. Good for ducting, collecting and blowing light abrasives. Min. bend radius 6". Working pressure: 25psi, burst pressure 75psi.